If you are already a member, login below for access to your Member Lightbrary. Please fill in your details below and a Password Reset link will be emailed to you. Become a Member today... It's FREE !!! Our Members are our Bestie Friends that hold a special place in our Heart. Create your own Lightbrary of Favourite posts. Bookmark articles, audios, & videos to access at any time, from any device. Create a Wish List of your favourite products, access all your previous eShop Orders, plus streamline your shopping through our store. Have you enrolled in one of our eCourses ? Unlimited access to all of your eCourses at anytime from your Membership dashboard. Am I already a Member ? If you have previously purchased or enrolled for a workshop/event through our Online Store (anytime since 2007), then you are already a UniversalLifeTools Member... Yeh !!! Simply use the Login fields (below left) to login and if you can't remember your password, then you can reset through the 'Lost your password' link. I am not sure if I am a Member ? If you are not sure you are member, first try to Register as a Member (below right). 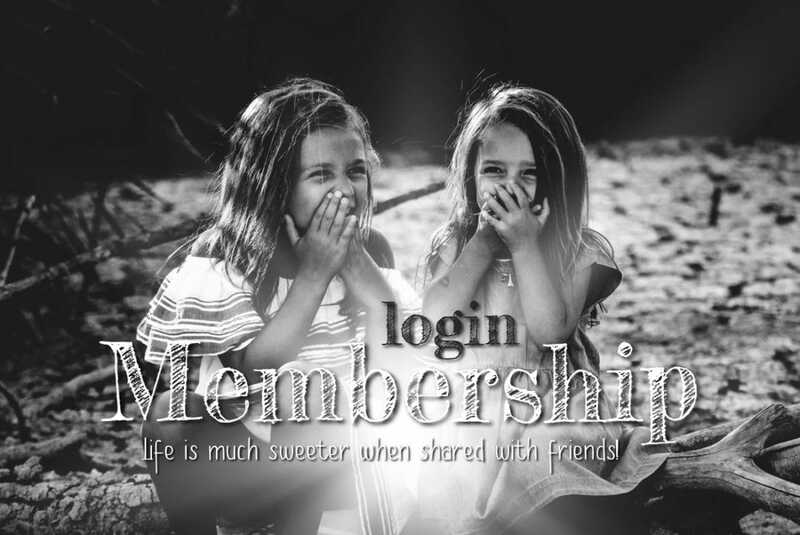 If you are unable to register (ie when you click submit nothing happens & hence you aren't automatically logged in as a new Member), that is because you are already Member. If this is the case, then use the Login form (below left) to login... and password reset if applicable. I am having problems Logging in, Help! After following the above advice, if you are still having problems, then please send us a note via our Contact Us Form and help will be at hand very soon. We also have a Frequently Asked Questions section below which may also help you resolve any problems you maybe having too ! I am trying to Register but the form is not working ? If you are trying to Register and the form is not working, then maybe you are already Registered ! If you have previously purchased or enrolled for a workshop/event through our Online Store (anytime since 2007), then you are already a UniversalLifeTools Member... Yeh !!! Simply use the Login fields to login above and if you can't remember your password, then you can reset through the 'Lost your password?' link. I am trying to Login but the form is not working ? 1. You are not yet Registered for Membership ? 2. Maybe you have the incorrect Password ? 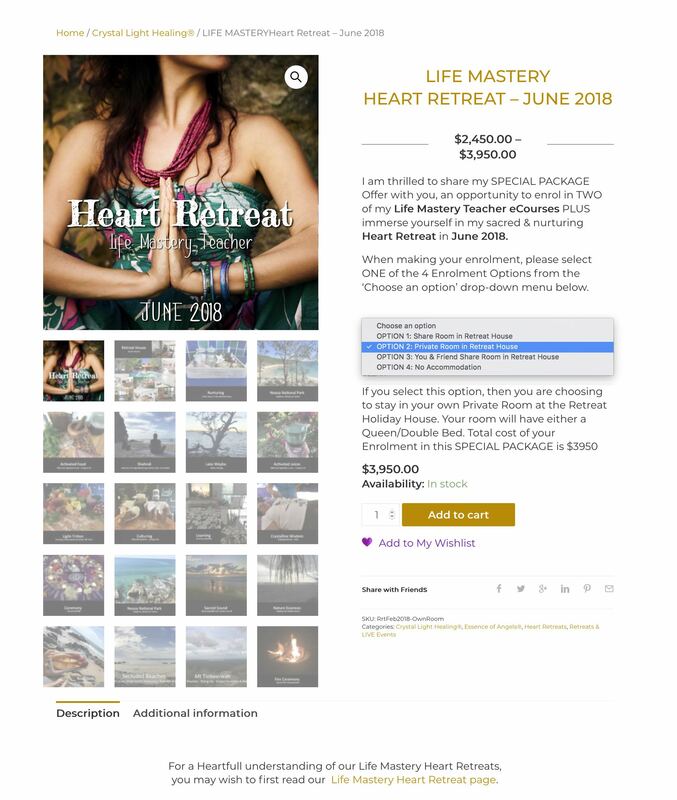 If you have previously purchased or enrolled for a workshop/event through our Online Store (anytime since 2007), then you are already a UniversalLifeTools Member... Yeh !!! Alternatively, you can become a FREE Registered Member by registering yourself per the 'Register' Form above. If you are definitely a Registered Member but the Login form is not working, maybe you password is incorrect ? If this is the case, then you can reset through the 'Lost your password' link within the Login form. I am unable to Login/Register ? After reading the above two FAQ entries above, 'I am unable to Register' & 'I am unable to Login' and having tried the recommended solutions, if you are still unable to Login or unable to Register, then please send us a note via our Contact Us Form and help will be at hand very soon. How can I view my previous Orders ? To view your Previous Orders, first Login to your Member Account above. Upon Login, you will have instant access to your Members Dashboard. 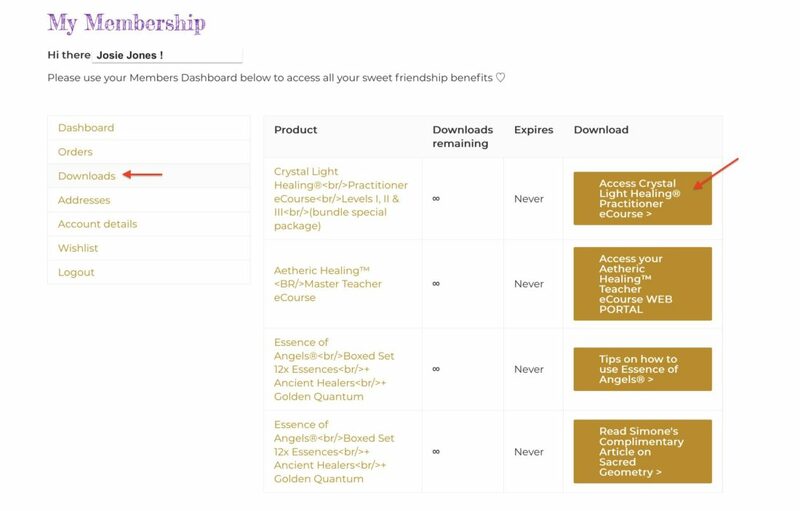 From your Members Dashboard, click on the 'Orders' link on your Members Dashboard as shown in the image below, and then click on the 'View' tab to be able to view each individual order. Please Note: If you have previously ordered from us and chose to express checkout at the time (ie not to login to your Membership, or not to Register Membership), then any express checkout orders will not be linked to your account, hence will not be displayed under your Members Dashboard Orders. How can I access my eCourses, Audios & eBooks ? To access your previously purchased eCourses, Audios & eBooks, first Login to your Member Account above. Upon Login, you will have instant access to your Members Dashboard. From your Members Dashboard, click on the 'Downloads' link on your Members Dashboard as shown in the image below - this link will show you EVERY download you have every purchased through our Online Store. A Download, is ANY invoice that contains a Download access link to one of our eCourses, Audios or eBooks or even articles. You can click on the individual gold buttons to access your eCourses, Audios, eBooks or articles. Please Note: If you have previously ordered from us and chose to express checkout at the time (ie not to login to your Membership, or not to Register Membership), then any express checkout orders that contained 'download links' will not be linked to your account, hence will not be displayed under your Members Dashboard Downloads. How can I change my Billing or Postal Address ? To change your Billing or Postal Address, first Login to your Member Account above. Upon Login, you will have instant access to your Members Dashboard. From your Members Dashboard, click on the 'Addresses' link on your Members Dashboard as shown in the image below. Then click on the 'edit' link of either the Billing or Shipping address boxes and change your address. How can I change my Password ? 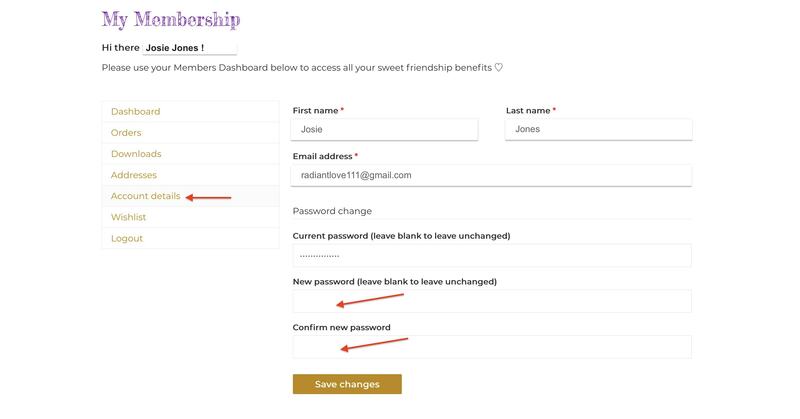 To change your Account Details, first Login to your Member Account above. Upon Login, you will have instant access to your Members Dashboard. From your Members Dashboard, click on the 'Account details' link on your Members Dashboard as shown in the image below. Then type in your 'New Password', then retype the new password 'Confirm new Password' and click 'Save Changes'. How can I access My Wishlist ? To access your saved Wish List items, first Login to your Member Account above. Upon Login, you will have instant access to your Members Dashboard. From your Members Dashboard, you can click the 'Wishlist' link on your Members Dashboard as shown in the image below. Alternatively, you can click on the 'My Wishlist' button further down the page. You can ALSO access your My Wishlist from the 'Shop' dropdown menu at the top of the page (see second screen print below). How can I add items to My Wishlist ? You can add ANY of our Online Shop items to your My WishList. To add items to your My WishList, you must first be a Registered Member AND you must have logged into your Membership Account. Login to your Membership account and then view an individual item product page within our Online Store. To add the item to your WishList, click the purple 'Add to My Wishlist' link under the Add to Cart button. In the example below, you can see the location of the 'Add to my WishList' link. 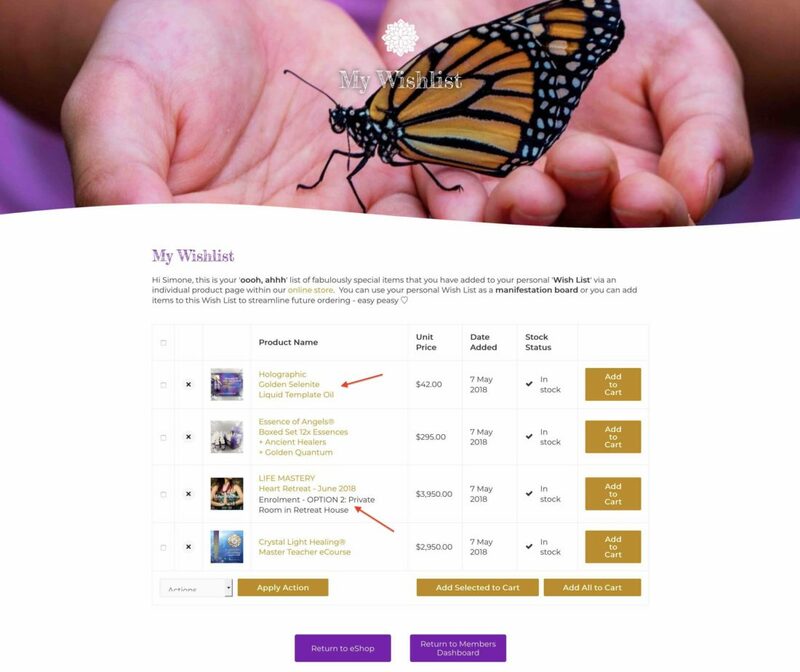 To then view your saved Wish List items, from the 'Shop' dropdown menu at the top of the page (see sscreen print below), click on the My WishList menu item - which opens your 'My Wishlist' page. Your 'My Wishlist' page then displays everything you have saved to your WishList (see the screen print below). 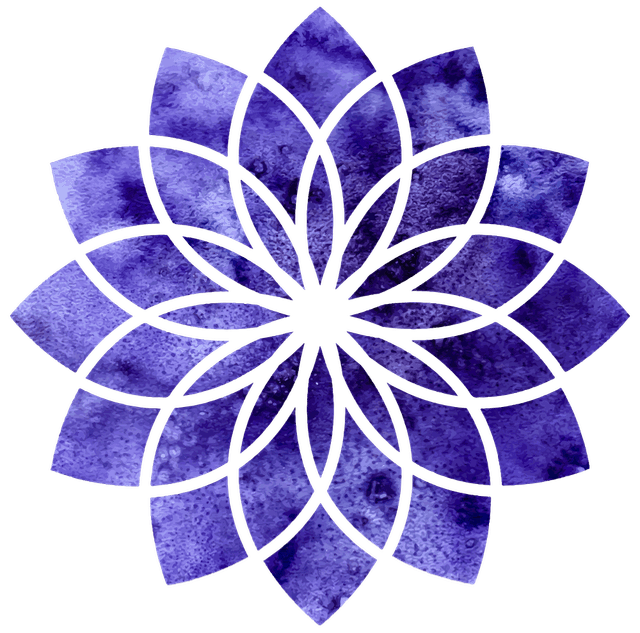 You can use this page to streamline your future purchases, or as a wonderful Visions Board for manifestation. I am having troubles adding items to My Wishlist ? To add any of of our Shop Products to your My Wishlist, you must first be Logged in to do so. You can Login from the 'My Account Login' dropdown menu (see screen print below). 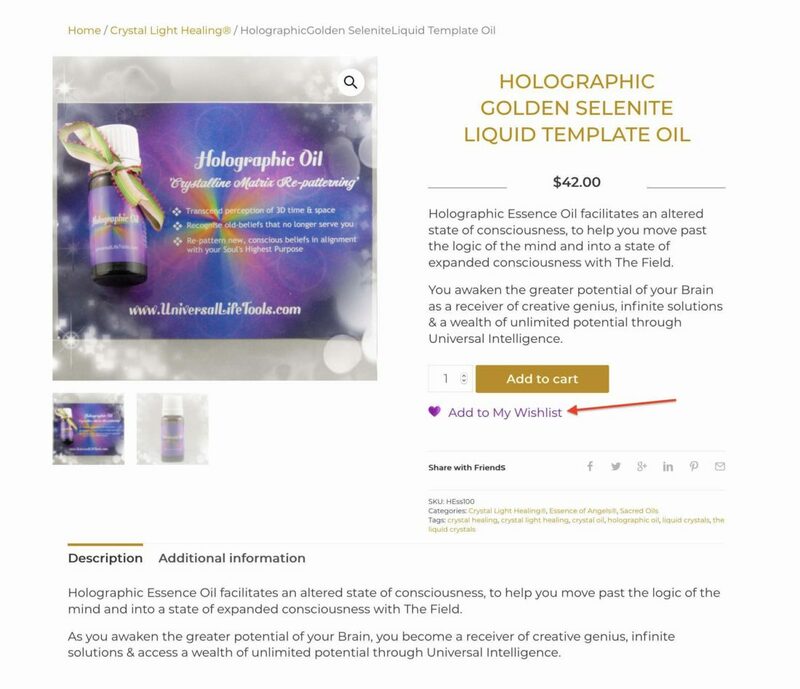 You then view individual product items in our Online Store and click on the purple 'Add to My Wishlist' link (that sits below the Add to Cart gold button). If you are having trouble adding the product to My WishList, ensure that if the product has OPTIONS available, you have selected the OPTION that you would like to add to the My Wishlist. If you haven't selected any of the OPTIONS, then the product cannot be added to your My WishList. Per the screen print below, from the My WishList page (accessible from the Shop Drop Down Menu), the variable OPTION that you chose for a product, will be displayed in your My Wishlist. Still having problems adding Products to your My Wishlist ? Then please let us know via our Contact Us Form and help will be at hand very soon. How can I access My Lightbrary ? 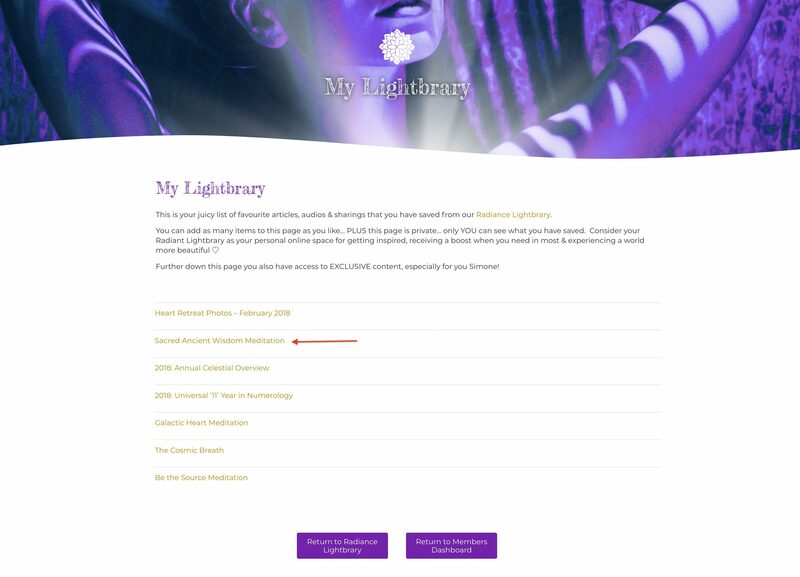 To access your My Lightbrary, first Login to your Member Account. Upon Login, you will have instant access to your Members Dashboard. From your Members Dashboard, click on the 'My Lightbrary' button further down the page. You can ALSO access your My Lightbrary from the 'Lightbrary' dropdown menu at the top of the page (see second screen print below). How can I add items to My Lightbrary ? 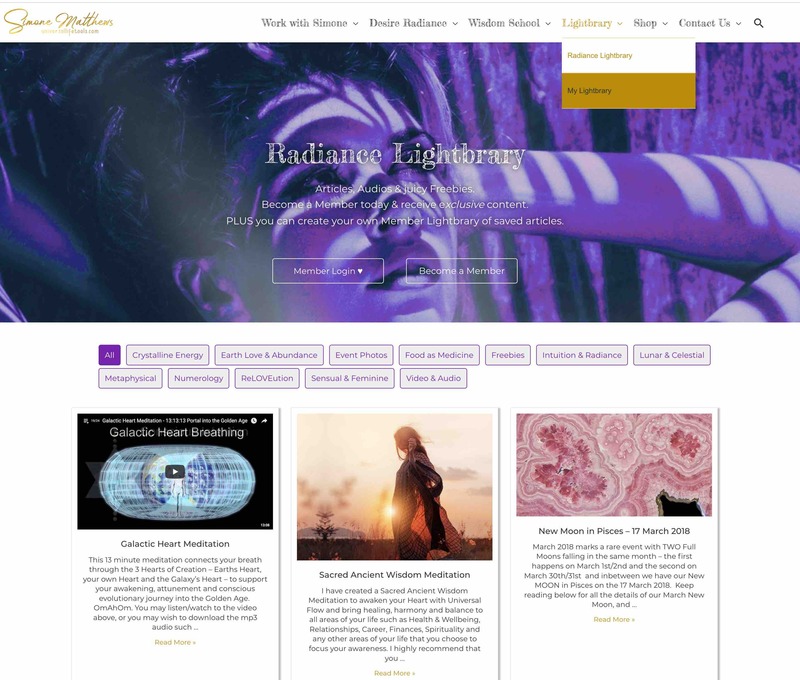 You can add ANY of our Radiance Lightbrary Blog posts to create your very own My Lightbrary. 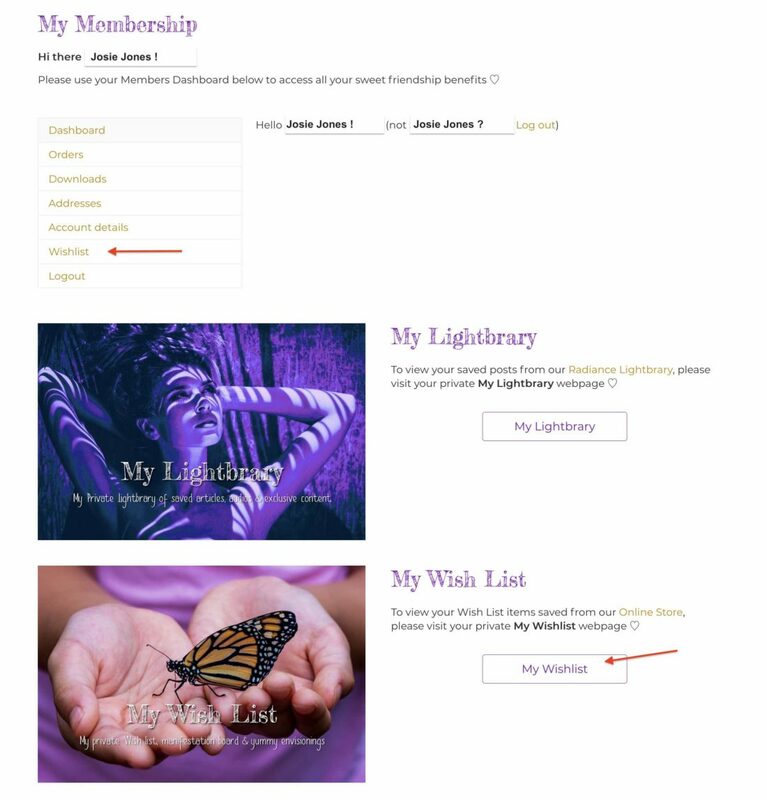 To add items to your My Lightbrary, you must first be a Registered Member AND you must have logged into your Membership Account. Login to your Membership account and visit our Radiance Lightbrary page from Main Menu dropdown menu (see screen print below). 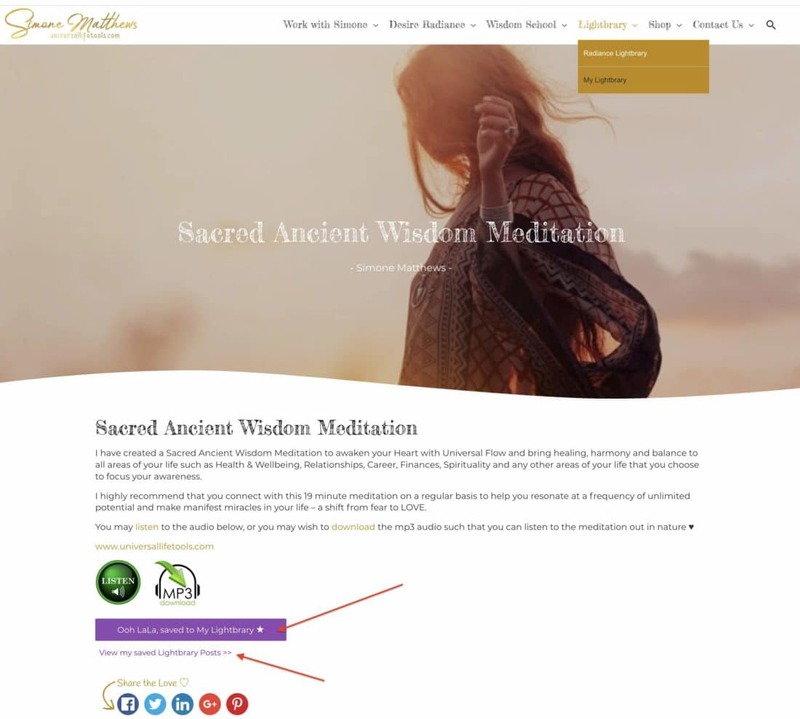 From this page, click on any of the Category Tabs (eg Crystalline Energy) to view our Blog Posts and then click on the Image or on the 'Read More >>' link to view the Blog Post. 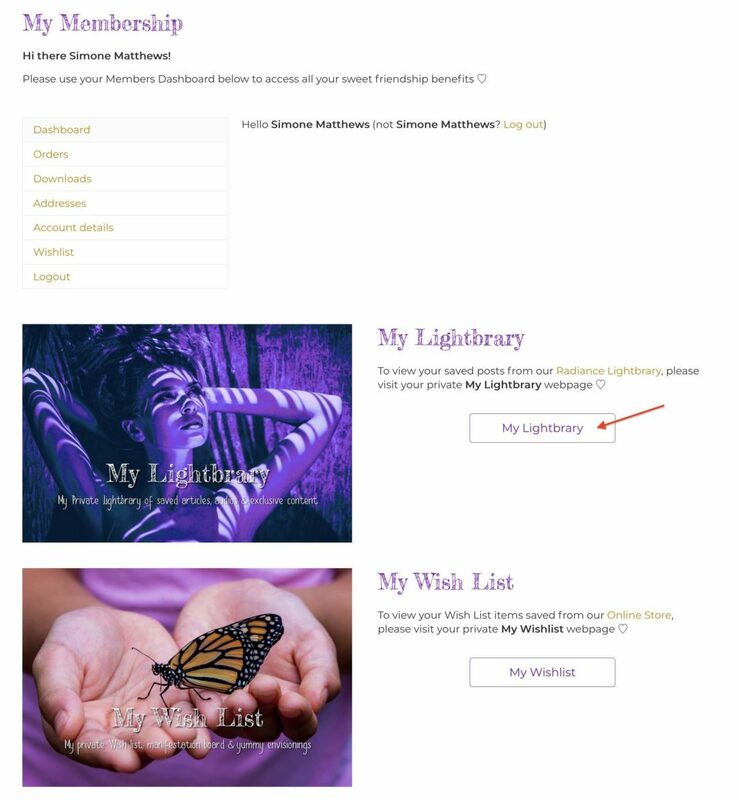 When viewing a Radiance Lightbrary Blog Post, you can add it to your very own Lightbrary by click on the 'Add this post to my Lightbrary' purple button that is displayed at the bottom of every Lightbrary Blog Post. The button then updates to let you know that the Post has been added to your Lightbrary (see the second screenshot below). You can then click on the 'View my Saved Lightbrary Posts >>' link below the purple button to view ALL of your saved My Lightbrary Posts. 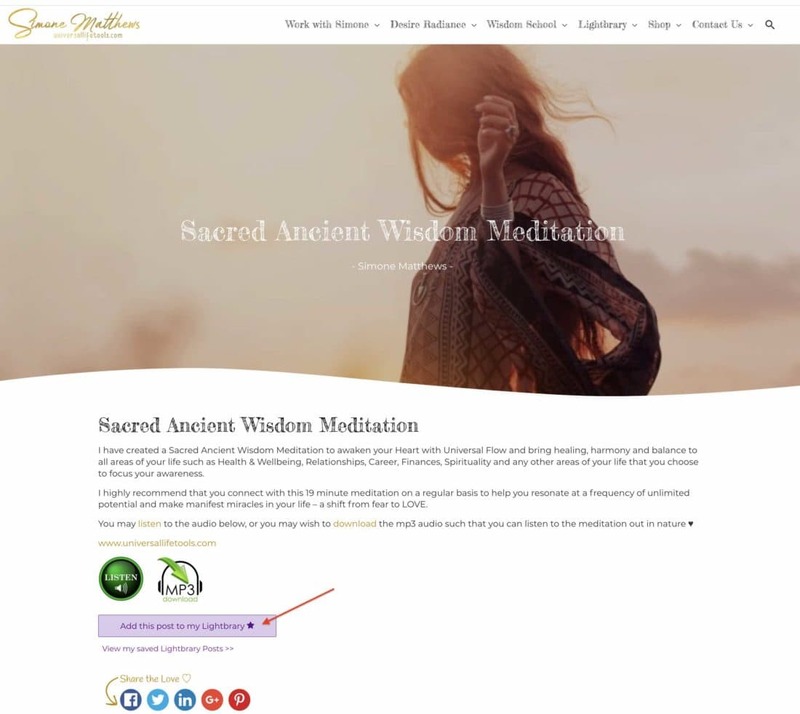 From your saved 'My Lightbrary' posts page, you can view ALL of your saved items and click on the links to read/access these posts at any time. I am having troubles adding items to My Lightbrary? 2. You MUST be a Registered Member to be able to Login. It is FREE to Register on our Membership page. Still having problems adding Posts to your My Lightbrary ? Then please let us know via our Contact Us Form and help will be at hand very soon.